There comes a time when every Hearthstone metagame grows stale and players get tired of seeing the same competitive decks over and over. We hit that point with the latest expansion Kobolds and Catacombs a while ago, but now, with the announcement of a new set of balance changes, we may be in for a major metagame shakeup. Here’s what you need to know about the nerfs before they drop in the upcoming 10.2 update. Bonemare: Mana cost raised from 7 to 8. Bonemare, the almost-universally strong skeleton horse we all love to hate, now costs 8 mana instead of 7. Still, the card gives you 9/9 worth of stats, with 4/4 of that being usable on board immediately. It’s nowhere near as powerful as it was at 7 mana, but it’s still a quality card. Corridor Creeper: Attack lowered from 5 to 2. You know a card is broken when, ceteris paribus, it gets nerfed by a full 3 attack. A lot of folks are saying this is a death knell for our dear Corridor Creeper. Personally, I think a 2/5 that can potentially be played for zero mana is still pretty damn good. Maybe we’ll see it in Hunter and/or Arena decks. Patches the Pirate: No longer has Charge. Patches the Pirate is arguably one of the strongest Hearthstone cards ever printed. Even as a humble 1/1 with Charge, it thins out your deck to increase your odds of drawing good stuff, it adds an early game body to the board at no additional cost, and its Charge effect means you can take control of the board in even the earliest turns of the game. For a neutral card that could be placed into decks from any class, Patches was often too good for any tempo-oriented deck to pass up. With this massive nerf, we may see some once-ubiquitous pirate card combos fall out of favor in the meta, making room for more interesting deck variations across all classes. Raza the Chained: Hero Power cost changed from 0 to 1. Raza the Chained wasn’t an overpowered card on its own, but when used in tandem with the Death Knight card Shadowreaper Anduin, gave players a free hero power that could deal massive, consistent damage in the late game. This nerf means that Raza Priests will have to use mana to combo their damage instead of getting it all for free, and that may be enough to remove it from the metagame altogether. 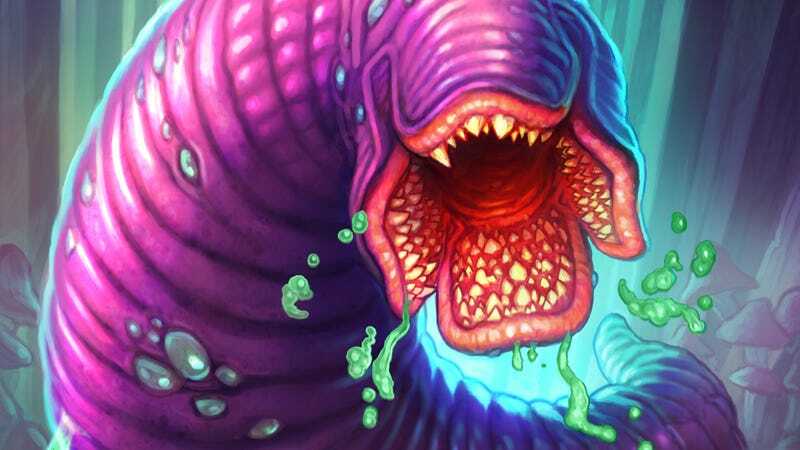 These nerfs bring Hearthstone some much-needed change, and should pave the way for more varied deck types. But a lot of players are concerned about the new problems they might stir up as a result. Another off-putting detail about these nerfs is that they seem to have arrived a few expansions too late. Patches has needed a patch for more than a year now, and Raza has been a Priest class game-changer since the Frozen Throne expansion launched last summer. With both of those cards rotating out of Standard play with the next expansion, the nerf comes just in time for them to become irrelevant in the game’s most popular ranked mode anyway. Still, there’s no denying that something needed to change. Both Corridor Creeper and Bonemare threatened to affect the metagame for another year to come. And for those who are still unsatisfied with their late arrival or their lack of impact on the Warlock class, well, there’s always the option to exchange nerfed cards for a full dust refund for two weeks after the patch drops, and maybe build a new deck to prepare for the Warlocalypse.